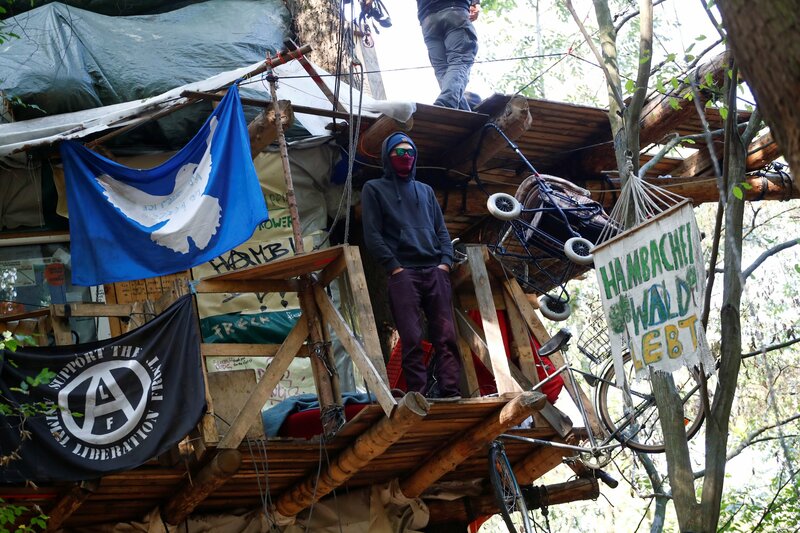 German police began to remove protesters on Thursday who have been living in tree houses for the past six years in the ancient Hambach Forest, located in the western part of the country. German utility company RWE is seeking to expand mining operations in the 12,000-year-old forest, and protesters have been camping out in an effort to save what is left. “This year’s clearing measures are necessary to maintain opencast mining operations and coal extraction over the next two years,” RWE said in a statement, noting that no agreement was reached with the protesters following negotiations that took place on Monday. The tree houses present a safety hazard and do not comply with building regulations due to a lack of emergency stairs and access for emergency services, officials said. Authorities arrived at the forest on Thursday with an arsenal of vehicles—including an armored car equipped with a water cannon and plow. Police asked protesters to clear the area within 30 minutes, or else they would be removed by force. Some officers who used cranes to reach the trees said that protesters were throwing stones and metal balls at them. Authorities said that it may take several days to completely clear the forest. “After the operation, we will monitor people and vehicles trying to come here in order to prevent the reconstruction of what we so painfully dismantled,” Spokesman Paul Kemen, according to Reuters. Despite investing billions of dollars into renewable energy, Germany is still dependent on coal and is home to 76 coal-powered plants. This is not the first time authorities have intervened in the forest. Hundreds of police officers descended on the site last week, removing dozens of protesters. While no arrests were made, officers noted that there were two small altercations. Meanwhile, the European Union’s Court of Justice ruled in April that Germany’s eastern neighbor, Poland, broke an EU law when it allowed logging in the Białowieża Forest, a UNESCO World Heritage Site. “The forest management operations concerning the Puszcza Białowieska Natura 2000 site that have been undertaken by Poland infringe EU law. The implementation of those operations in fact results in the loss of a part of that site,” the court said, according to Politico. Poland, however, said that the logging was necessary to stop the outbreak of a bark beetle infestation.